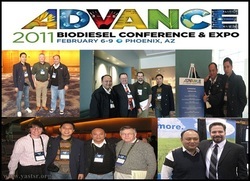 On 6-9 February 2011 Tunku Syed Razman Environmental Foundation and His Royal Highness Tunku Syed Razman attended the NBB National "Bio-Diesel Conference & Exhibition" in Phoenix, Arizona, U.S.A. Also attended by the advisor of YASTSR Tunku Mohsinudd in Bin Tunku Nohd Jamil. Including Directors Mr. Frederick Deo Chang Foo, Mr. Hasshahari Bin Johari Mawi , United States Special Envoy, Mr. Richard Pirics and Agro Technology Sdn Bhd, Mr. Allan Deo Chang Siong. The purpose of this visit was to register Tunku Syed Razman Environmental Foundation and Arena Agro Technology Sdn Bhd a subsidiary company of the Foundation as a permanent member of the National Biodiesel Board(NBB). 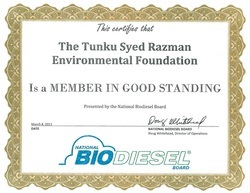 On 8 March 2011 Tunku Syed Razman Environmental Foundation now been recognized as a "Member In Good Standing" in the NBB.